I recently heard someone talking about about what we share on Facebook and Instagram vs. what our lives really look like. I know we can all be at least a little guilty of sharing only the best stuff. I don’t think we’re (usually) trying to look better than we really are. I think it’s mostly that those social media outlets are a lot like a highlight reel. We post the things we want to remember, the joys we want our friends to be able to celebrate with us, the things that make us laugh, and yes, occasionally our frustrations and disappointments (but we’d better watch out, because there are some who will rake us over the coals for sharing those…but that’s another post entirely). 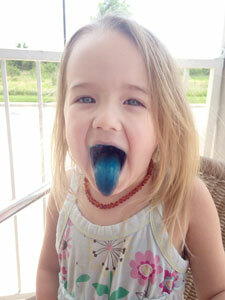 Man those once in a blue moon days where we play board games all morning, get snowcones (complete with fantastically blue tongues), eat lunch at Starbucks and spend the rest of the day at the beach are AWESOME! I hope I always remember them! A majority of my real life is very mundane and not pretty. I bribe the older girls by letting them watch Netflix in the morning when they get up if they’ll be quiet and not wake me and Smiles! Breakfast is often poptarts, and lunch is frequently microwave macaroni and cheese. Sometimes, if Smiles is asleep in my lap and I’m editing pictures or writing and Artist asks what they can have for a snack, I tell her, “Anything you can find!”I say this knowing full well that popsicles and jelly beans are both things she’s capable of finding. 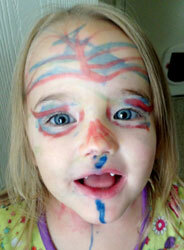 As entertainment, Artist and Boo like to color all over themselves with markers. Smiles prefers to pull everything out of my desk drawers. Tonight, Misteris brought home Taco Bell for dinner…for the second night in a row. Now I’m hiding in the computer room nursing Smiles while the other girls are having giant melt downs over being required to make their beds, and Misteris and I just placed bets on whether or not they’re cleaning their room like we told them to.